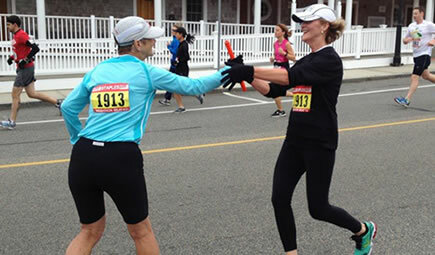 The Pioneer Valley Women’s Running Club is a group of walkers and runners of all abilities, living in western Massachusetts and northern Connecticut. Are you a consistent walker ready to train for your first 5K? Or a competitive runner looking for new friends to train with? Whatever your goals, you will find supportive friends and a network of training partners with the PVWRC. Join us and stay healthy while having fun! The Pioneer Women’s Running Club offers a $1,000 scholarship for college-bound female high school athlete. PVWRC is the first and largest all women’s running club in Western Massachusetts and Northern Connecticut. The PVWRC is a civic-minded club that hopes to support a female runner in its local community through this annual scholarship fund. The scholarship aims to reward a well-rounded, intelligent, civic-minded, college-bound high school senior who’s passionate about running. Please visit our About Page for the list of past winners. The 2019 scholarship info is available here! Send a quick message to pvwrc1@gmail.com so we can make sure there is someone to welcome you. When we’re not racing, we’re running throughout the Pioneer Valley. We’ve been out running at Forest Park, Ashley Reservoir, Ludlow Reservoir and the Southwick Rail Trail. Come out to run and walk and socialize on-the-move, and get more fit in the process! Contact us and we’ll let you know where we’re going to be! 2019 Scholarship Application is LIVE! Check out our About Page for the direct link! A big THANK YOU to Fleet Feet Longmeadow and Jill and Tim Murphy for hosting a shopping event April 12th for our members! We are very grateful for the donation back to the club! Please visit them in Longmeadow at 680 Bliss Road or check them out online at www.fleetfeetlongmeadow.com.